This was a beautiful celebration of the superheroes inside of each and every one of us! 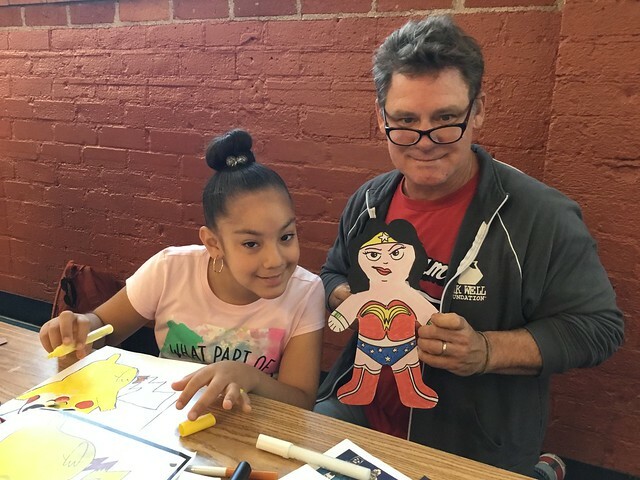 The brave kids at Gilda’s Club are dealing with cancer in their lives and so we talked with them about where they draw their power, what makes them feel strong, and how can we turn those traits into all kinds of super characters. The children unleashed their brilliant imaginations on personalities and back stories including Pizza girl who flings hot cheese at her villains, a gorilla astrophysicist who lives on the moon, a Spider Ham sidekick, and the most unsettling, “Eye Finger Switch!” Thanks to our volunteers: Ray Alma, Elana Amity, Scott Brundage, Dennis Calero, Lisa LaBracio, and Elizabeth Winter and to our fearless leader Franz Palomares for leading this super duper night! So much talent in this house! 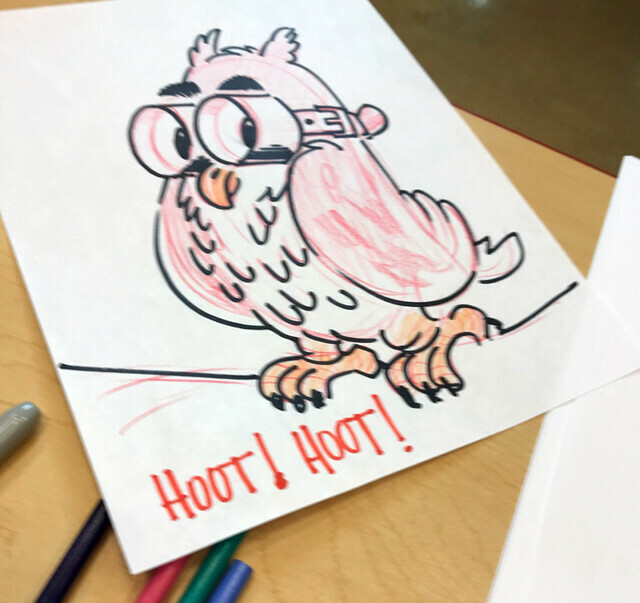 Our Director of Events for the Ronald McDonald House, Jane Archer, taught how to create characters from cancer treatments and medication to help the kids see them in a little more familiar and less intimidating light. The kids picked right up on the theme and designed intricate characters, many with healing powers or traits of strength and bravery. There are some real artists here and we were proud to meet them and their lovely families. Thanks so much to our volunteer family: Jane Archer, Elana Amity, Stefano Imbert, Ed Steckley, Eleanor Rahim, Elizabeth Winter, Julia Sarcone-Roach and Peter de Séve. We had a spectacular day, drawing with the children of St. Mary’s Hospital! We’ve been coming to visit these kids for years and they always fill us with such joy and amazement as they bring boundless energy and imagination to every bit of art we make together. This time we drew Scooby Doos, big tough gorillas, and silly monkeys too. One little girl even helped us draw a Princess Monkey! 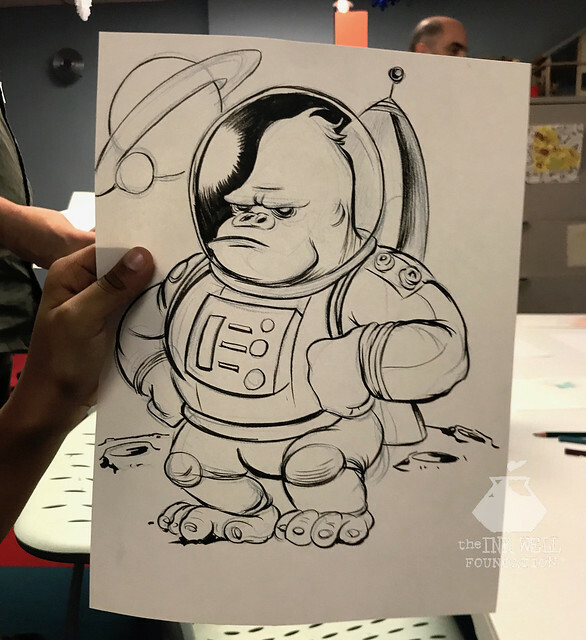 Some kids got their caricatures done while others learned character design. We are deeply grateful to our all-guy gang of volunteers that came to draw today: Tim Savage, Marty Macaluso, Joe Vissichelli, Scott Brundage, and our fearless Event Director, Ray Alma, who lead the show. Thank you, beautiful kids and staff of St. Mary’s! We’ll be back again soon! We had a spectacular show with the kids at Mount Sinai! The kids are all equipped with art sets in their own rooms and they draw along with us while watching our live call-in drawing show. 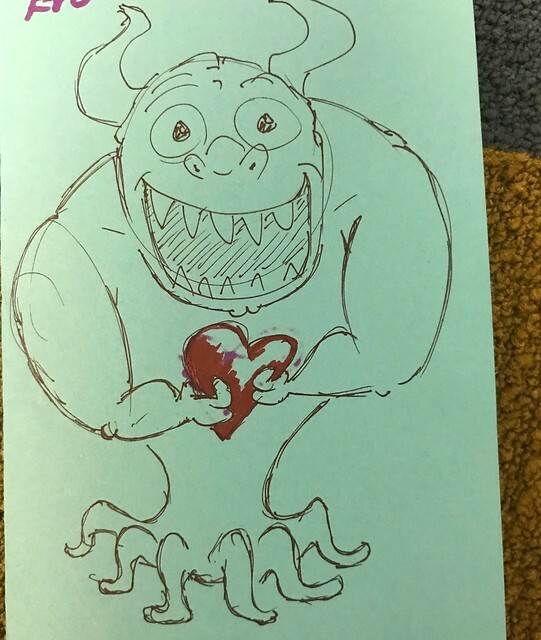 Lots of kids texted and called in as we all drew together: one girl requesting a princess from Elana. 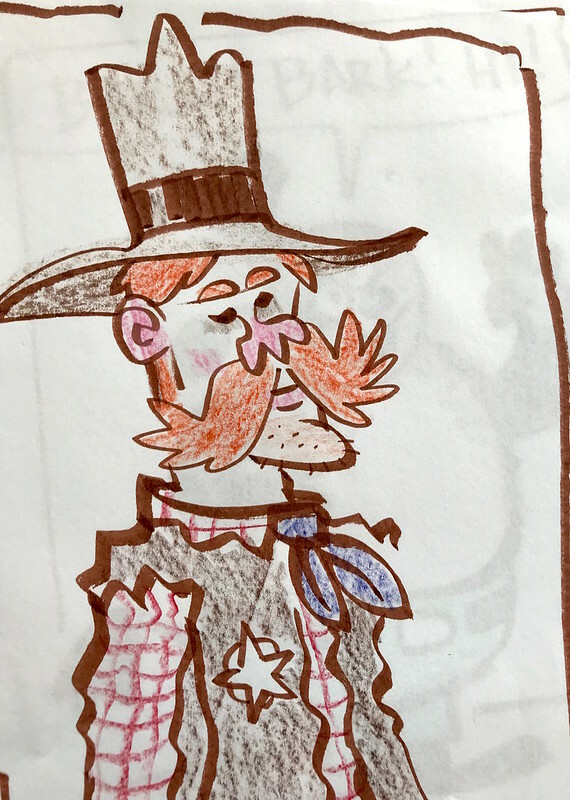 Dennis suggested drawing a doll princess and the little girl who had texted her request texted again saying, “that’s amazing!” She then helped Elana choose colors for her pretty doll dress. Then Dennis got a request to draw a superhero in a wheelchair which was a blast! And he drew Spider-Man wearing a Santa hat in honor of the new Spider-Man movie. The time flew by so fast, we could have kept on going all day! Thank you, children and staff of Mount Sinai Hospital, to our dear volunteer, Dennis Calero, and beloved Ink Well Event Director, Elana Amity! Happy new year, everybody!!! One boy drew “Thank You” out of balloon characters and brilliantly carried the balloon strings to the inside of his card, where a little boy was holding them. There he wrote how much he appreciated a friend who was kind to him. 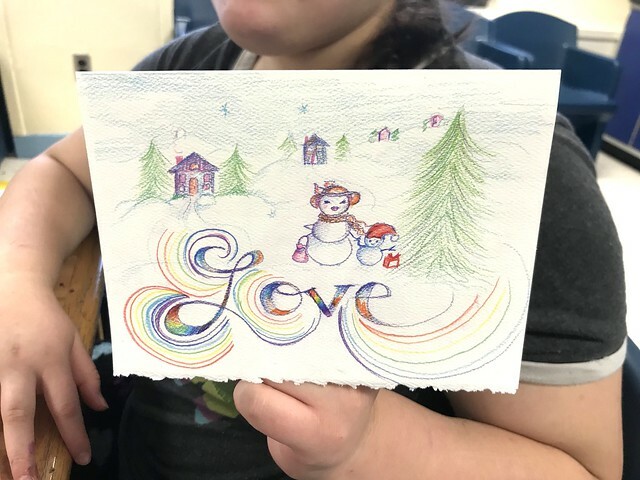 A young girl drew a wintry scene where light struck the snow-covered ground and refracted into letters, spelling “Love” because she said, “when the snow falls and the light hits it just right it feels like love to me.” There were magician Santas, saber-toothed tigers, robot Godzillas, wolves and monkey Santas too. Each child left with their own holiday gift of a sketch book and drawing set so they could keep creating on their own. And we all left with full hearts and beautiful memories of these brave kids. 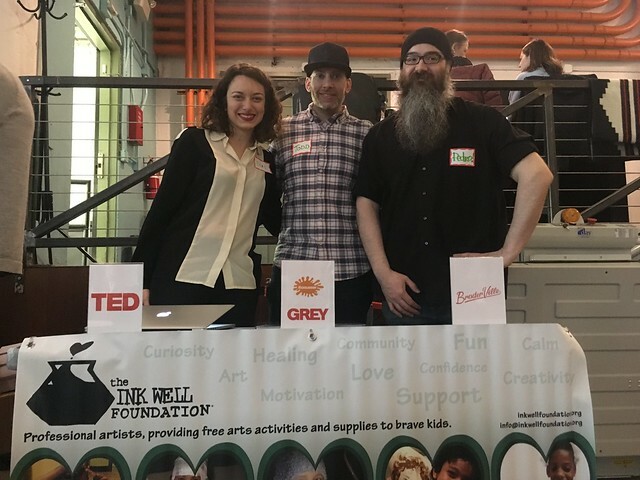 Thanks to our Ink Well volunteers: Drew Dernavich, Scott Brundage, Ellie Rahim, Barbara Garrison, Elizabeth Winter and a huge welcome back to our dear Jane Archer. Thanks also to the fantastic staff at Bellevue Hospital for always being so professional and helpful in all of our activities. Wishing everyone a happy holiday season with many messages of love to all! 10/24/18 Ronald McDonald House, L.A.
Our skin crawled with excitement as we and the wonderful the Ronald McDonald House kids had a spooktastic Halloween party in Hollywood! We all drew spooky pictures, made bat puppets, and painted some ferociously good faces. The Ronald McDonald House provides a home-like environment for families with critically ill or injured children who must travel to fulfill their healthcare needs. Gilda’s Club’s annual halloween party was frightfully fun! We face painted Darth Vaders, drew caricatures ghoul-ore, the kids fluttered about with their bat puppets and everyone left with arm fulls of art by the artists behind Ice Age, Marvel Comics, Mad Magazine, TED Ed Animation, Rugrats, The Venture Bros and much more! Thank you, trusty volunteers who made this night possible: Ray Alma, Joan Chiverton, Barbara Garrison, Lisa LaBracio, Maria Scrivan, Ed Steckley, Elizabeth Winter. And thank you to the beautiful families and staff of GC, who always welcome us so warnly. Gilda’s Club is open to children who have been diagnosed with cancer, have a parent or loved one who is living with cancer, or are grieving the death of a loved one to cancer. These two gents. We are so lucky to have them on our Mount Sinai Hospital drawing team. Thank you, Peter de Séve, for bringing your New Yorker cover drawing, Ice Age character designing amazingness to join with the Nickelodeon-Disney-Cartoon Network animating fantasticness that is Pedro Delgado. The kids loved drawing migrating animals with you on our drawing show this week. ❤️And thank you, Elana Amity for being the hostess with the mostest as always. If you can draw a square, a line, and a circle, then you can draw anything. Today we showed the kids how to make cartoon characters out of the simplest shapes. A million thank yous to our dear Pedro Delgado, who stepped up to host the show today. And thank you to the strong kids who imagined and laughed and drew along with us. We were blown away by the New Alternatives for Children kids’ sand paintings! Check out their masterful designs and inventive ways of using real sand to create summer scenes. Thank you so much to the NAC staff and kids for having us, to our wonderful Event Director, Lisa LaBracio, and to our devoted volunteers: Pedro Delgado, Barbara Garrison, Stefano Imbert, Abby Merrill and Julia Sarcone-Roach. After the event, we gave each child their own art kit so they can keep on creating. Go, kids, go! We loved making super hero self-portraits with the Camp TLC kids! We asked the campers to think of their own strengths and skills, what they’re proud of, and how they’d like to help people. Then the kids transformed wooden and paper figurines into their super-selves! Thanks to Camp TLC, the Boys and Girls Club of Hollywood, and to our Ink Well volunteers: Jeremy Arambulo, John Dubiel, Chad Frye, Steve Hirt, Nora Meek, Valerie Nielsen, Ashley Simpson, Zane Yarbrough, and W. Coast Director, Joseph Scott. A huge welcome to first timers, John, Steve, Nora, Valerie and Zane! And thanks to Batman for swooping in too 🙂 The Camp TLC serves children who have experienced life or medical trauma. We were honored to be a part of NY Foundling’s career day that helps foster youth explore their skills and interests so that they may thrive in the professional world. This is particularly important for those nearing the 18 year-old age limit, where many support services end and they will need to support themselves. 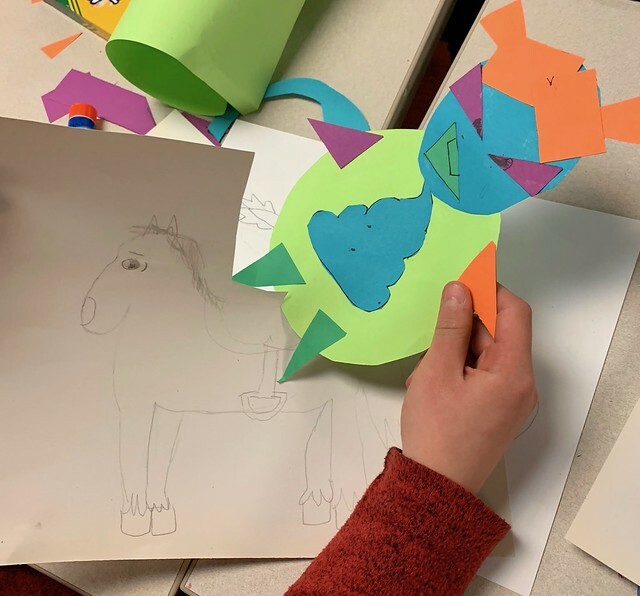 We brought artists from the advertising, animation, and cartooning fields to teach about working at places like TED Animation, Grey Worldwide, Nickelodeon and more. 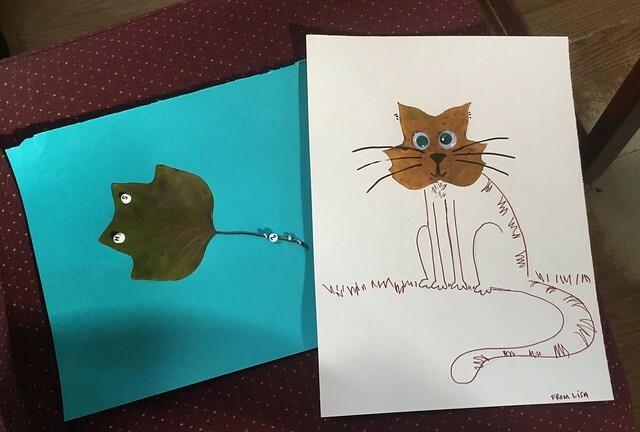 The kids were thrilled to learn that you can actually make art for a living saying, “wow, I never even imagined jobs like this!” We’re happy to share insight and look forward to working for you one day, kids. Thanks very much to NY Foundling and to our Ink Well volunteers: Lisa LaBracio, Pedro Delgado and Todd Broder. The kids called in their requests for dragons and cats and Smurfs, drawn by volunteers Dennis Calero and Stefano Imbert. All the while everyone chatted about the ways we can stop clogging the sea with plastic, be kinder to our fellow animals, and work toward changes that will reduce our impact on this shared world! 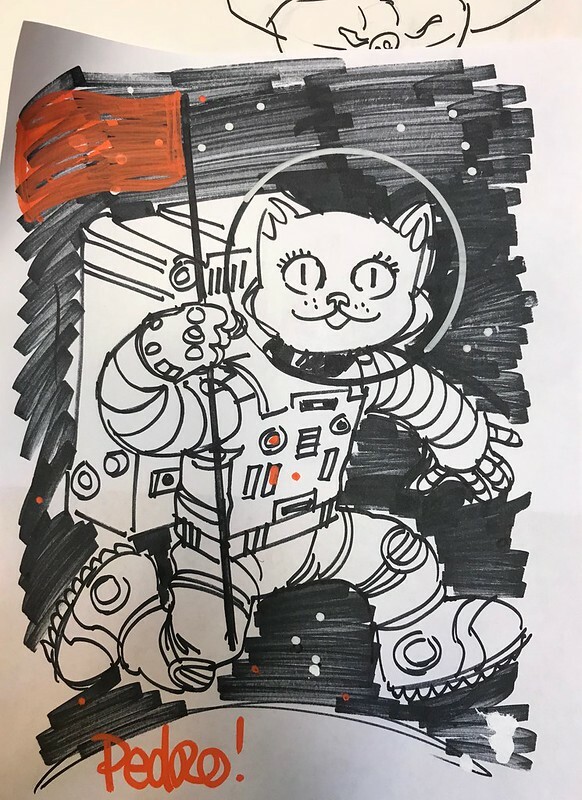 Ink Well event-theme contest winner, Elizabeth Kamke, inspired our night of drawing astronauts, rockets, and a special birthday picture of Spiderman in Space for one little girl’s 9th birthday! 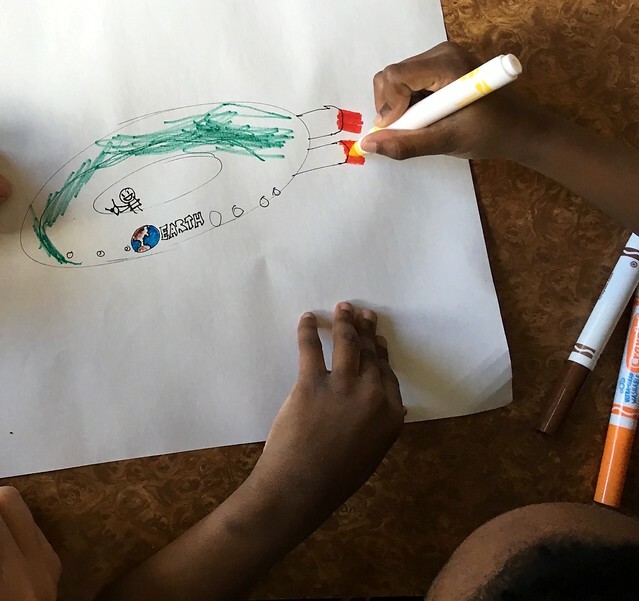 Lots of kids called and texted: one girl wanted to know what our favorite outer space movies were, and a little boy called in to chat with Pedro as he built a space suit out of rectangles- the boy said it reminded him of Sponge Bob in space. We had a wild drawing show at Mount Sinai Hospital this week! New Yorker cartoonist, Corey Pandolph, and DC/Marvel Comics artist, Dennis Calero, taught how to draw superheroes while the kids texted in advice, like “make Superman’s costume all the colors of the rainbow!” and “draw a bunch of flying fish!” Then they made Corey and Dennis have a speed draw-off, where they drew as many characters in as little time as they could, which was hilarious. Thank you so much to Elana Amity for hosting, to Corey and Dennis for volunteering, and to all the kids at Mount Sinai who helped us put on a fantastic show. The Valentine’s fun continued at New Alternatives over the weekend! 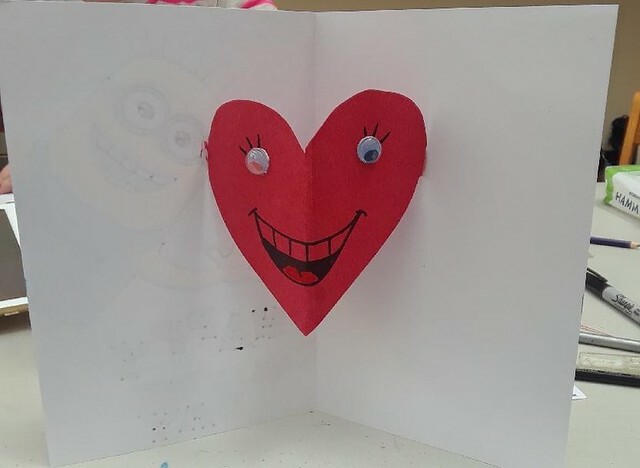 We brought heaps of crafts for the kids and they made the most heart stopping cards and pictures to give to their loved ones. Thank you very much, NAC, for having us, to our Event Director, Lisa LaBracio, and to our loyal volunteers: Elana Amity, Sergey Aniskov, Drew Dernavich, Abby Merrill and Tim Savage. We made mountains of Valentine’s with the Gilda’s Club kids! There were so many creative ideas like a pop-up bouquet, love-lorn dragons, smitten kittens and big-hearted horses. Thank you, kids and Gilda’s Club staff, for welcoming us and thank you to our volunteers: Dennis Calero, Joan Chiverton, Pedro Delgado, Dayna Gonzalez, Elizabeth Winter, and to our Director of GC events, Franz Palomares for leading such a great event. We had a joyous night, making pop-up snowflake cards with the New Alternatives kids! The kids came up with beautiful designs and messages to share with their loved ones and we helped them make a big confetti, gluey mess! (We helped clean up after too). Thank you to our Director at NAC, Lisa LaBracio, for leading this merry night, and to volunteers: Howard Beckerman, Stefano Imbert, Abby Merrill, Elizabeth Winter, Pedro Delgado and Dennis Calero, and most of all to the great kids and staff at NAC! 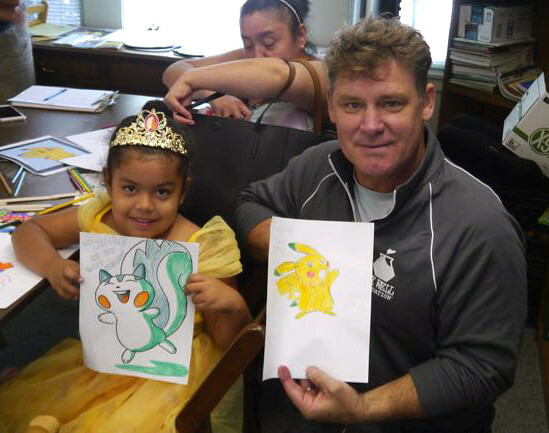 We face painted, bat puppeted, and scary drawinged the heck out of ChildHelp LA this weekend! The kids came up with the greatest scenes of ghouls and goblins and haunted pumpkins while we drew their caricatures and had some cackling laughs with all the wonderful care takers there. Before we left we made sure each child received their very own colored pencil set, sketchpad and eraser. AND a few lucky devils even got a designer Ink Well t-shirt! Thank you, parents, guardians, kids and staff at ChildHelp for welcoming us. We love being a part of your village! Thank you Ink Well Volunteers: Jeremy Arambulo, Chris Harmon, Christian Lignan, Joseph Scott (West Coast Director), Ashley Simpson, and Monica Tomova. Hooray for our version of Hollywood! 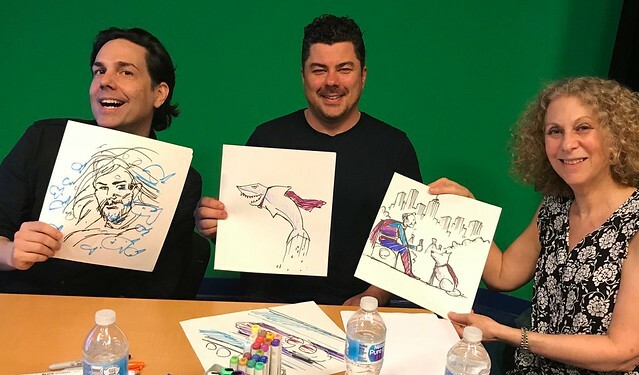 Master illustrators, Dennis Calero and Pedro Delgado put on a terrific KidZone TV show with the children being treated at Mount Sinai Hospital. They all worked together to create BatMan, Mario and owls that hoot hoot! 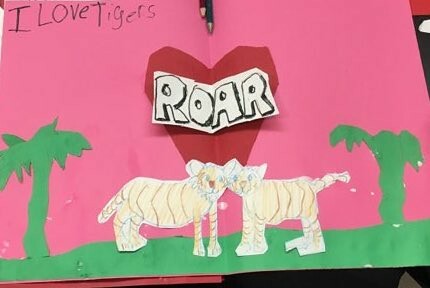 Check out the fantastic stop motion shorts, dreamed up by the beautiful Bellevue kids! They all collaborated on three story ideas: one space adventure, one underwater scene, where three lonely mermaids meet and become friends and one where three explorers meet in the desert during a rain storm and one gets whisked away by an eagle! 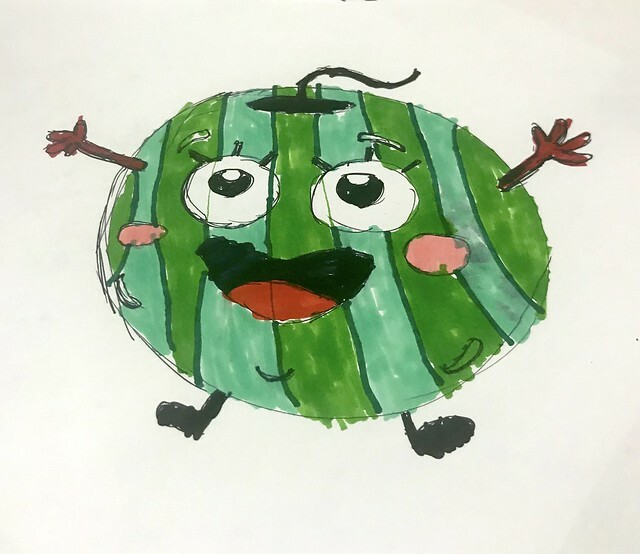 The kids designed each character and prop and quickly learned how to make them animate. We are so proud of these kids for their patient attention and ability to create so much in just an hour and a half’s time! Thank you, volunteers: Sergei Aniskov, Drew Dernavich, Corey Pandoloh (welcome first timer!) and Elizabeth Winter and to our lovely co-hosts Jane Archer and Lisa LaBracio for making this such a productive, special evening.